I first saw this one in my long ago youth. 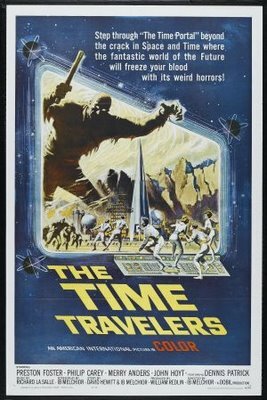 A 1964 film, I never saw it in the theater, but it probably reached those late night Saturday night monster/science fiction movie feature with the local host made up like some goofy looking character. Ours was, hell, I don’t remember now that I think back. The show was from the High Point station, “Die Point” as our genial host called it. I was about fifteen or sixteen at the time and loved that stuff. This movie could have fit into the fifties: low budget, really cheap sets, and a whole lot of fun for a young kid. A local station that runs old movies, old series, twenty-four hours a day ran it. I loved watching every second of it. It concerned a group of scientists working on a time window, trying to look into the past or future. One overzealous guy opens the circuit wide open(they use a lot of scientific babble to explain it all) and shorts out a number of lines. freezing it at 107 years in the future. Quite by accident, they discover it’s more than a window, a door they can step through. The picture they see is a bleak setting and one of the characters, an electrician, jumps through and goes running off to explore. The doorway is flickering, unstable, so the older scientist jumps through to bring him back. The younger soon follows when they see some strange figures appear in the distance follow. Soon weird creatures try to come through and the woman fights them off with a fire extinguisher. Worried, she follows in as well. The door is becoming more unstable. Well, you know what happens. Door closes, scientists marooned, chased by weird mutants, take refuge in a cave, a sudden force field blocks the entrance, a normal looking woman, along with a pack of androgynous looking androids invites them in to the underground city where a group of scientists had survived the nuclear war. The earth unlivable on the surface and supplies running out, a ship is nearly ready to take the survivors to a habitable planet around a near by star. Suspended animation with the androids tending the ship, raising plants for food, the four are invited to accompany them until calculations show the added people will strain resources, food, fuel, air, beyond capacity, and it will take too long to re-adapt everything. They won’t be allowed to go. Then it becomes a race against time to build a new version of their time portal. The advanced science helps a bit. One of my all time favorites of this type of movie. It actually held up better than I thought it might. A fine example of overcoming a miniscule budget to turn out a decent product.